While some issues can be inevitable, a lot of problems can be avoided with the right maintenance routine. Our experts can make sure your automatic garage door keeps functioning optimally for as long as possible. As arguably the most important parts of your garage door, the springs require more care and attention than any of the other components. The best way to ensure their good working condition is to have our professional technicians lubricate them on a regular basis. We'll also perform the necessary adjustment to ensure their tension and weight distribution is balanced, which will prevent a lot of potential issues. 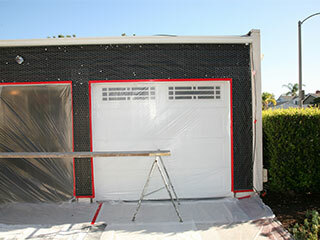 Your garage door tracks are the parts of your system that ensure the smooth and straight movement of the panels. If they are dirty, or become blocked by debris, you could experience a variety of problems, most common one of which is a door that got off track. This is extremely dangerous, as the door could end up collapsing. If your track develops some bending at sections, it could cause your door to get stuck halfway, or prevent it from opening or closing correctly. Our technicians will straighten your tracks if they find any dents, or replace them if they become too damaged. Your garage door opener can suffer from a variety of mechanical and electrical problems. The best way to avoid them is to have a professional inspect its motor and circuit board and replace any worn gears and fried wires before any major issue develops. Our technicians will make sure your opener continues functioning optimally for as long as possible. Our experts at Garage Door Repair Plainfield can make sure your overhead door system will keep operating at an optimal condition for as long as possible. Call us today to schedule an appointment.